Problem: Create simple compositions demonstrating an accurate understanding of saturation. Limits: Compositions will fit within a 6×6″ area and will be realized with painted cut paper. Materials: Creative Process Book, pencils, Bristol Board 9×6″, gouache paints, brushes, palette, rags, water container, scissors, exacto knife, ruler/t-square, glue, misc. chosen materials. Concepts: Hue, Saturation, Prismatic Color, Muted Color, Chromatic Gray, Achromatic Gray, Luminosity, Primary Colors, Secondary Colors, Complementary Colors, Warm, Cool, CMY, RGB, RYB color models/systems. Technical Skills: painting techniques, draughmanship with ruler/t-square, exacto knife and collage. Using the handouts provided, plan out a Traditional Color Wheel, but also incorporate CYM (Cyan, Yellow, Magenta) gouache, if you have them. Start with the primary triad from the CYM system (Cyan, Yellow, Magenta) and create a color wheel that includes all the colors in the visible spectrum: Red, Orange, Yellow, Green, Blue, Violet. Practice mixing and applying colors on a piece of scrap bristol first. Create colors from primary colors Cyan, Magenta, Yellow (Example: Magenta + Yellow = Red) and then secondary colors from Red, Yellow, Blue (Example: Red + Yellow = Orange) . Do NOT use pre-mixed paint hues. Try to create all colors from Cyan, Magenta, Yellow. Once you have successfully experimented with the triad relationships (primary and secondary) from both systems, think about how the colors relate to each other. Think about what each color might represent: mood, emotion, object. Experiment with mixing each triad together, what color is produced? Come up with a unique approach to the color wheel concept. See examples presented in class. Make sure your final color wheel composition is laid out with a clear connection to the original primaries and secondaries. Add your image. Don’t forget to caption! 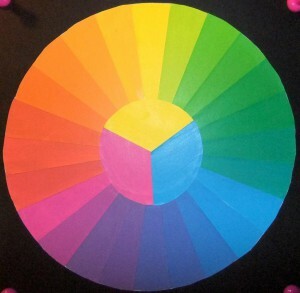 Include a description of your concept and explanation of the color wheel. Add a gallery with all three studies. Don’t forget to caption! Include a description of each study and what you learned. See Class 22 for references. Objective: Via a collaborative FREESTUDY exercise, demonstrate the ways in which Cross-Sensory Metaphor (or meaning) and visual hierarchy can be conveyed using Saturation, Value, Color Temperature, and a Grid. Working in groups, create a mockup of a poster for a band, which is named after a cross-sensory word or phrase. The colors, composition, and style will be based on the (3) cards you choose. Choose (1) Color card. It will be warm or cool. Consider your concept card before choosing one or two colors for your palette. Choose (1) Composition card. Using a piece of tracing paper, ruler and pencil, define the grid that is used in the sample poster layout. Choose (1) Concept card. Come up with a cross-sensory word or phrase that has at least two sensory meanings (Sight, Sound, Touch, Taste, Smell.) Consider your composition and color temperature before finalizing your word or phrase. SWAP! The color, Concept and Composition should work together. If one of your cards doesn’t fit. Swap one of your cards with another group- it must be the same type of card. Transfer your sample poster grid to a piece of bristol. Create a composition using the sample poster as a guide. Use paper scraps, colored pencils and/or paint, your cross-sensory word or phrase, and appropriately chosen warm or cool colors. You must use all three levels of saturation in your design (prismatic, muted and chromatic gray). The title of your poster will be the cross-sensory word or phrase that you choose. Take note of the fonts used in the sample poster. Try to emulate the font style. All other smaller copy/text on your poster could be represented by appropriately sized and colored rectangles of paper or paint. Make sure all elements in your composition are aligned to the grid. Decide as a group how you will complete your poster. See Class 23 for references. If you missed this class, contact me ASAP. Based on your collaborative FREESTUDY exercise (part 1), recreate your team’s band poster concept using Illustrator.